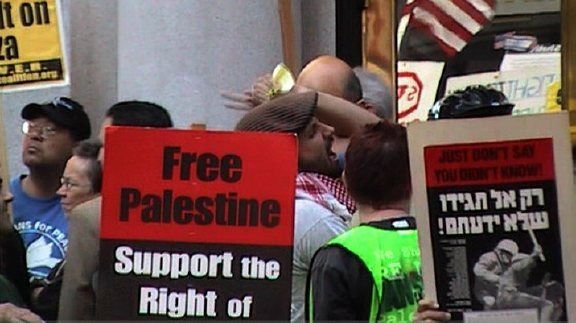 The recent fighting in and around Israel spilled over onto the streets of San Francisco on Thursday, July 13, when Palestinian and left-wing groups staged a protest in front of the Israeli Consulate in the city's Financial District. An equal number of pro-Israel counter-protesters showed up to make their voices heard as well, and from the start the two sides were battling it out with a war of words and symbols. 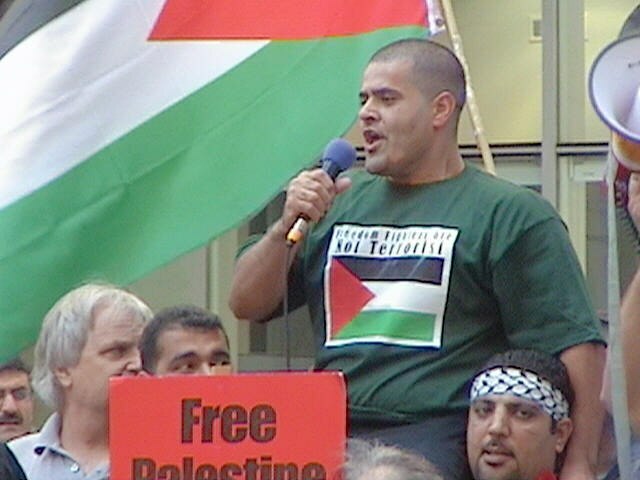 The protest was organized by Al-Awda (a group devoted to dismantling Israel and replacing it with a Palestinian state), A.N.S.W.E.R. (a communist group) and a coalition of other Islamic and socialist organizations. The police separated the two groups onto opposite sides of the street, to prevent any physical altercations. 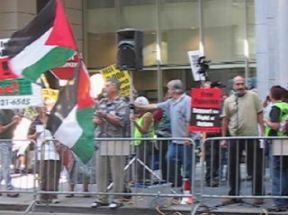 The Palestine supporters on the left directly in front of the Israeli Consulate building waved Palestinian flags, while the Israel supporters on the right waved Israeli and American flags. Montgomery Street served as a demilitarized zone between the warring factions. There were about 200 to 250 activists on each side, which is the largest counter-protest organized by the pro-Israel side that I've ever seen in San Francisco. Some of the men on the Palestinian side dressed like this, making masks out of kaffiyehs so as to look like, uh, "militants" or "terrorists," depending on whom you ask. A T-shirt vendor was doing brisk business selling shirts that declared, "I Am Democratic, I Voted for Hamas." Many of the people on the Palestinian side were overtly pro-Hamas, as evidenced by their chants and signs. We did it your way. 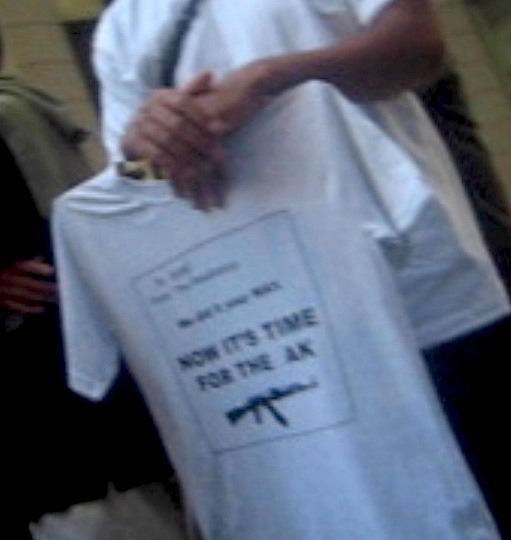 NOW IT'S TIME FOR THE AK"
I also took this blurry shot of the same shirt. Several people were wearing them. Palestine will be free, from the river to the sea! A contingent of men in fundamentalist Islamic garb showed up and occasionally shouted confrontational slogans. Here are two of them conferring. The Jews are our dogs! A view of the action from the pro-Israel side. Speaker: We are here today to protest Israeli crimes. Israel has three dirty secrets. The first dirty secret, the first dirty secret is that it's an apartheid state built on the principles of racist Zionism. 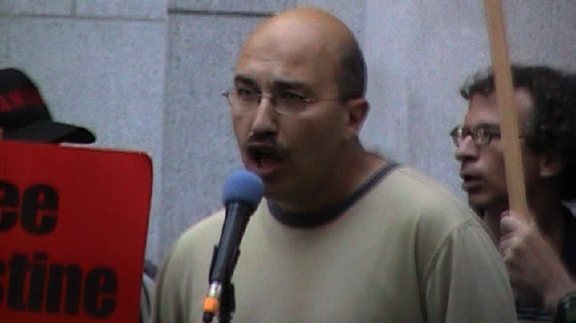 Pro-Israel Proesters: Liar! Liar! Liar! 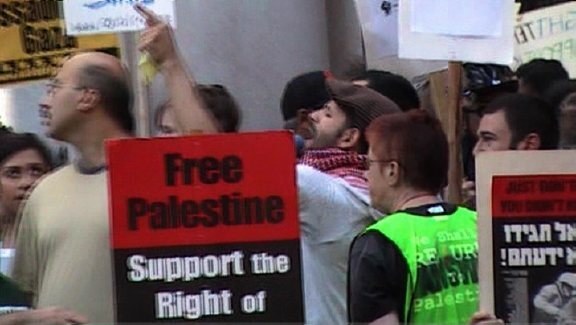 Pro-Israel Protesters: Liar! Liar! Liar! Liar! Liar! Liar! Liar! Liar! Liar! Liar! 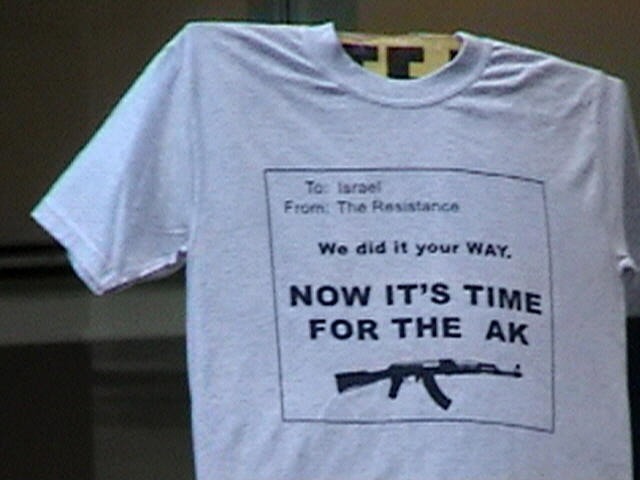 The counter-protesters held up signs like this, while across the street the protesters chanted phrases in favor of Hezbollah and Hamas. On a side street, a pair of Palestinian supporters were getting ready to enter the protest, using a window as a mirror to make sure their kaffiyeh-masks looked just right. I got a blurry snapshot of the moment. Unfortunately for them, a pair of cops noticed their preparations. When the protesters said they weren't planning to do any violence, one of the cops asked, "Then why are you dressing up like a terrorist like that?" while the other made them empty their bags to make sure they didn't have any weapons. I didn't see how the situation resolved itself. I waded through the crowd with a hidden camera. 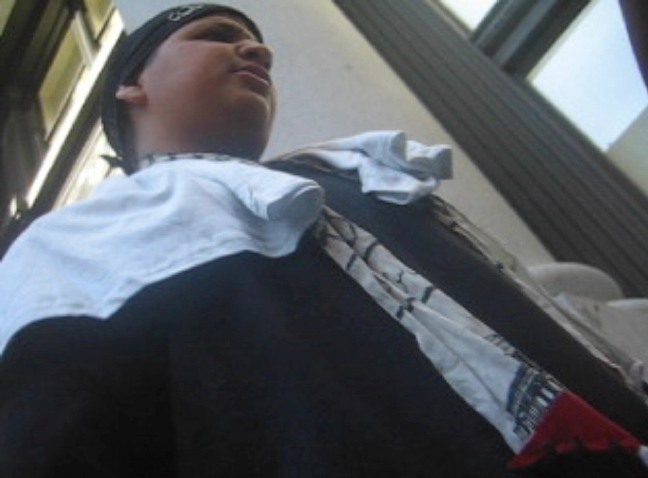 This young protester was one of several wearing kaffiyehs that show the Dome of the Rock Mosque, reflecting the agenda of the "Al-Awda" supporters in the crowd to reclaim Jerusalem as the capital of a "river-to-sea" Palestine. A jolly time was had by all. A.N.S.W.E.R. 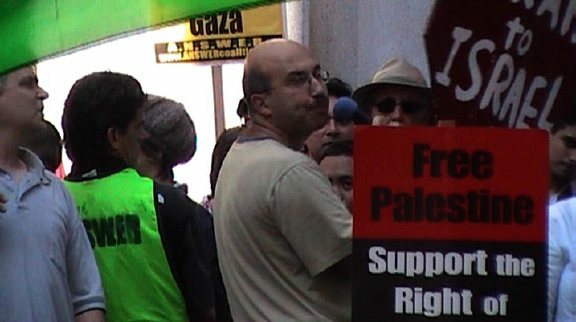 supplied freshly printed signs to the protesters, reflecting events (such as the fighting in Lebanon) that had transpired just hours earlier. Some of the A.N.S.W.E.R. signs echoed the Hamas talking point that the 9,000 Palestinians in Israeli jails had all been "kidnapped" by Israel. ...but instead the police just used them to block the view between the rival groups on either side of the street, apparently to defuse some of the tensions and verbal hostilities. A police helicopter hovered overhead. The protest dissipated between 6:30 and 7:00pm, and luckily the police presence helped to ensure that there were no physical confrontations either during or after the rally. 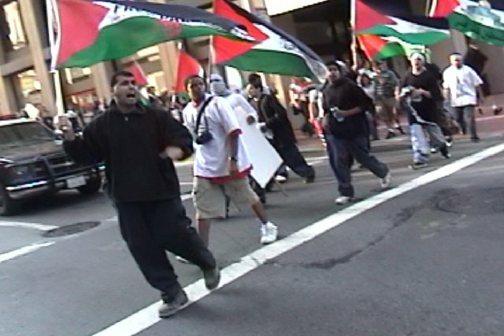 This video shows a breakaway group of Palestinians after the main rally was over going through San Francisco apparently saying anti-Semitic statements. (QuickTime mpeg video, 2.8mb) (video courtesy of B.J. of Dafka). The words, unfortunately, are hard to make out, though several readers have confirmed that the protesters are saying "The Jews are our dogs!" in Arabic. "Yahud" (audible in the video) is the Arabic word for "Jew." And the Jews are our dogs! Beerooch, beedam, neefdeek ya Falastin. [Translation: 'With spirit, with blood we will free you, oh Palestine'.]" To see more photos of this event at Getty Images, click here. A video report by KTVU's Amber Lee can be viewed here.